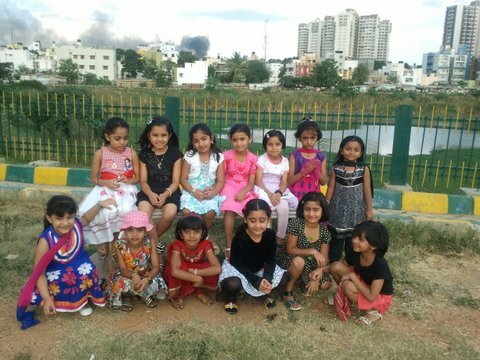 Nishka recently turned six and to celebrate her birthday, she and her dozen friends, spent the evening at Puttenahalli Lake. Yes! It was an excited all-girls group, accompanied by Nishka's parents. The lake tour was a part of the birthday party schedule and the little girls were thrilled at being outdoors during a party. When asked why she decided to take the children to the lake, Nishka's mom, Nupur said that she wanted to do something different. "In the house we entertain them with art and craft or a video. Nishka's friends had not been to the lake and I felt the birds would excite them. Also this was a good opportunity to spread awareness about the lake." The children took a long walk around the lake, spotting the birds in the water, on trees and in the sky. The families of coots and whistling ducks were quite visible with the naked eye, but viewing them through binoculars was a different thing! The girls couldn't wait for their turn with the binoculars. The "blue bird" in the shallow waters (the Purple Swamphen) was a major attraction, because of its vibrant colour and its proximity to the fence. 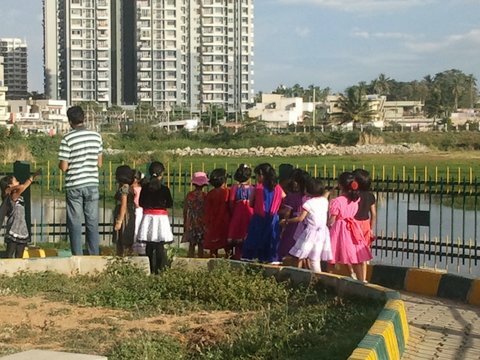 Apart from seeing the life that the lake supports, and learning the names of some of the birds and plants, the children were told a story on the importance of lakes and why we should work towards preserving them. We hope it was an enlightening hour for the children that they will long remember. HSBC volunteers continued with their help at the lake for the fourth Saturday today. The jobs they did included protecting the small plants at the entrance by making brick borders around them (involved digging and then placing the bricks around the plants), cleaning up the area along the fencing line and moving the heap of weeds to the far end composting area. 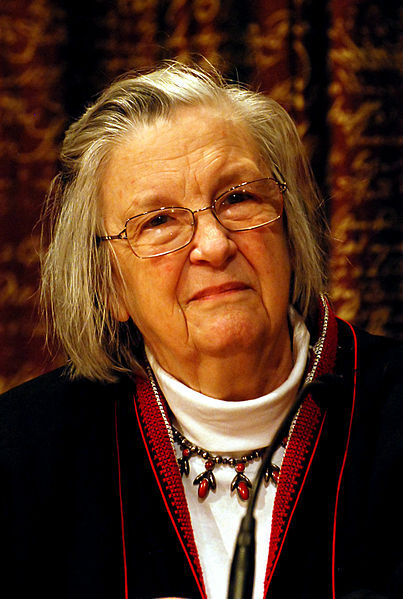 PNLIT mourns the death of Dr Elinor Ostrom, winner of the 2009 Nobel Prize in Economics for research that analysed how people can co-operatively manage common resources such as water and forests, without the need of government regulation or private ownership. She won the prize for Economics, though she was not an "Economist". 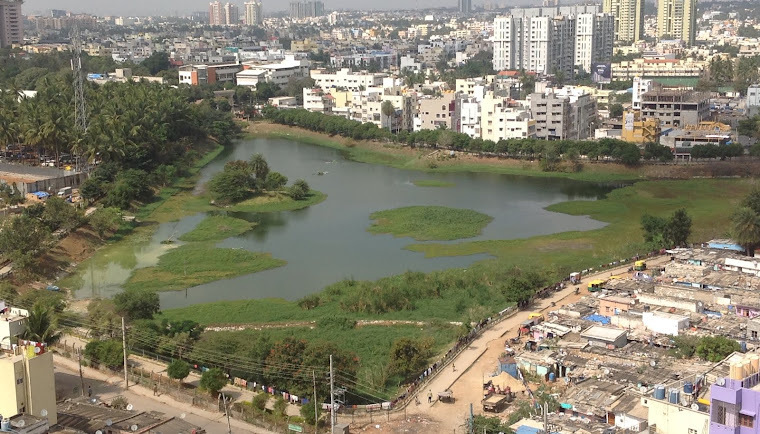 Her work included lakes, and she was a keen supporter of Bangalore's lake revival. Dr Ostrom's book of 1990 called Governing the Commons is considered as one of the "field guides" for conservationists involved with community projects. In the book, she takes the stand that most common resources are well-managed when those who stand to benefit are close to the resource and to each other. Dr Harini Nagendra, Urban Ecology Coordinator at ATREE Bangalore and Asia Research Coordinator at Indiana University, worked with Dr Ostrom and co-authored papers with her. In Feb 2012, Dr Ostrom was in Bangalore for the Khoshoo Memorial Lecture at ATREE, and she visited Kaikondrahalli Lake and planted a tree there. Read the obituary written by Dr Nagendra here. "We request you not to miss this opportunity to voice your views to BDA. 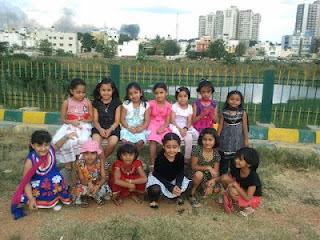 Together we can ensure that we all play a collaborative role in determining the destiny of Bangalore." Do you have suggestions that can help make Bangalore a better place? Please spend a few minutes to read the message below. You may then send your suggestions directly as mentioned below. Greetings from Namma Bengaluru Foundation. (http://www.bdabangalore.org/RMP-2015%20Public%20notice.pdf) for which citizens can give inputs/suggestions in writing to BDA by July 7, 2012. This is a statutory requirement starting the process to define and guide how Bengaluru needs to develop till 2035. The document that will finally result from this exercise is Revised Master Plan (RMP) 2035. We request all Bengalureans, resident welfare groups, NGOs, industry associations, social groups to take this opportunity to send their suggestions to BDA as soon as possible. In asking for citizen inputs ahead of the process to construct RMP 2035, BDA is being sensitive to the views of citizens. We welcome it and hope to catalyse citizens inputs for Master Plan 2035. · Write directly to BDA to the Office of the Town Planning Section of Bangalore Development Authority, T. Chowdaiah Road, Kumarapark (West), Bangalore-560020. You could consider copying us at Namma Bengaluru Foundation at # 3J, NA Chambers, 7th 'C' Main, 3rd Cross, 3rd Block, Koramangala, Bangalore - 560 034 or email copy to us at NBF@namma-Bengaluru.org. In our consolidated submission to BDA we will be referencing your inputs. · Write or email us directly at the above addresses of NBF – we will consolidate and send it across to BDA. Please ensure you give us your name, address and Organization name if applicable when you send us email or postal mail directly. We request you not to miss this opportunity to voice your views to BDA. Together we can ensure that we all play a collaborative role in determining the destiny of Bangalore. We at NBF in consultation with interested, knowledgeable citizens have been articulating a few generic views about RMP 2035 with the BDA which we reiterate below: · RMP 2035 must emanate from a grounds up exercise involving citizens and agency stakeholders. Widespread public and inter agency consultations should be held throughout the process. · In phasing the activities leading to the final notification of RMP 2035, a visioning exercise about the future of Bangalore needs to be the starting point. All other activities must flow from the overarching vision and guiding principles for the development of Bengaluru city which is developed in a consultative manner. · For RMP 2035 to be successful, alignment across multiple government agencies is critical. For starters, the BMRDA regional plan and BDA RMP 2035 needs to be in sync and developed simultaneously. Secondly, the various civic agencies (BBMP, BWSSB, BESCOM, KPTCL, BMTC, BMRCL, DULT, RTO, Police, etc.) need to be an integral part of the emerging vision and more importantly, adhere to the guiding principles of RMP 2035 as they go about their plan implementation – we are essentially asking BDA and the State Government to ensure that this alignment happens between the agency plans and RMP 2035. 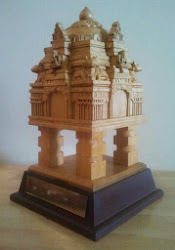 · We advocate the setting up of a Bangalore Spatial Information Centre (BASIC). We need one agency that is the custodian of the base map for Bangalore and keeps it continuously updated. Other civic agencies can build application layers for their use around this base map. Spatial planning has to become an integral part of RMP 2035.
. We need a 'As is' mapping of the current ground realities followed by thoughts about what the 'Should be' state of Bangalore. And RMP 2035 should set out a road map to get from 'As is' to 'Should be' that is achievable in practice. The 'As is' exercise would also help identify the deficits existing on the ground across planning districts and fixing them planning district by district should be part of the details of RMP 2035. · There is the issue of the 74th Constitutional amendment that requires planning to be the role of the locally elected local government (BBMP in our case). In principle, we believe this is the right way to go about it but there is a need for the State Government to enable the local government to play this role. Till this happens, we believe we ought to work with the existing structural arrangements in place – in this case it is to ensure that the RMP 2035 driven by the BDA is a robust document built with citizen and civic stakeholder inputs. The time is short but this is only the beginning of the RMP 2035 process. Let us use this opportunity to get engaged by sending our views to the BDA. It's been two years since we formed PNLIT! 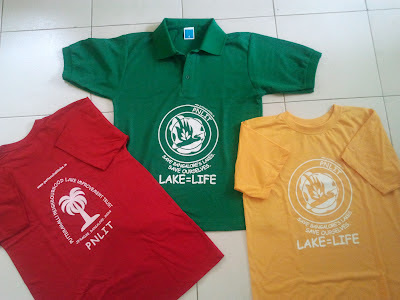 To commemorate Founder's Day, today we launch our PNLIT LAKE=LIFE T-shirts. The purpose of the T-shirts is to increase awareness about the importance of lakes and PNLIT's model of citizen participation in the preservation of our Public Open Spaces. 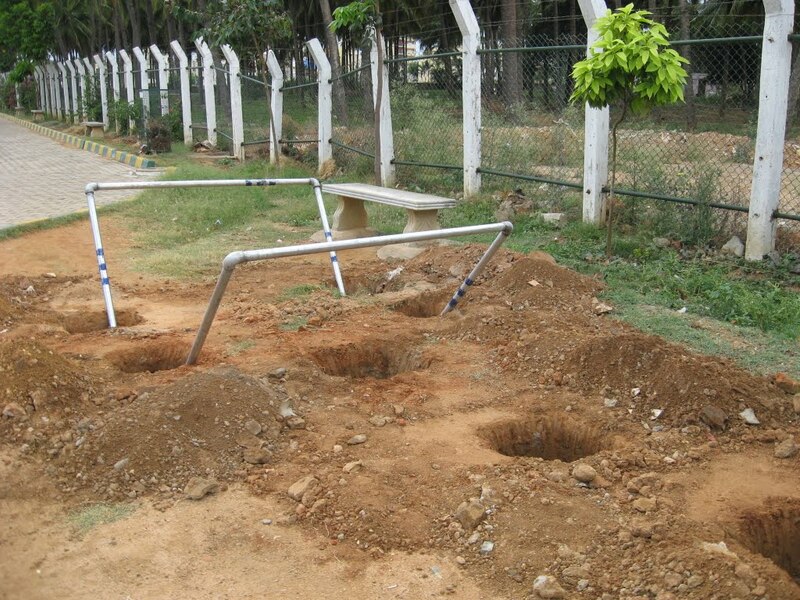 The money generated will go towards the maintenance and improvement of Puttenahalli Lake. Our thanks to Nagesh of Opus CDM for the creative design – concentric ripples of water, the reflection of the clouds with the shadow of a bird and a tree-leaf… together signifying "life" at a lake. These "Anniversary Limited Edition" Unisex T-shirts are available in Green Polo neck (sizes S, M, L, XL - currently Rs 390, Assorted colour Round neck (sizes S, M, L - currently Rs 280) and suitable for children from approximately Age 8 upwards and adults. or email puttenahalli.lake@gmail.com / pnlitonline@gmail.com. 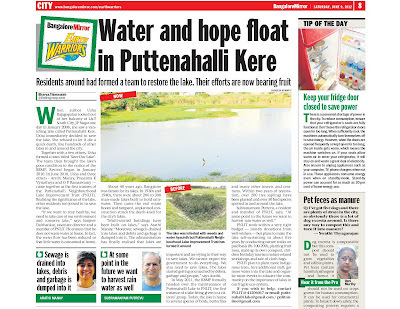 The past year has been very eventful and busy for us, with our focus on making Puttenahalli Lake a well-patronised Public Open Space and a secure avian habitat. Our sincere appreciation to our volunteers: PNLIT Mitra, PNLIT Young Rangers and other Support Volunteers who have provided invaluable help on various activities as and when they have been able to spare the time. We received numerous enquiries from other citizen groups and individuals from Bangalore and other parts of India and interacted with many of them. Several groups, formal and informal have subsequently been formed to save, restore and preserve their local lakes. A lot of recognition has also come our way - featured on Times Now Amazing Indians, shortlisted as a finalist for the Namma Bengaluru Awards, interviewed and featured in various media - television, radio, internet and print. We hope that all this is an indication of the viability of citizen participation in local governance. Along with the BBMP, we are looking to establish the "Puttenahalli Lake Model" as a replicable and self-sustaining model for saving, restoring and preserving lakes. The most recent recognition is the nomination for the Procam People's Green Star Award. Voting is currently in progress and scheduled to end in the third week of June. Don't forget to show your support by voting for PNLIT to win the People's Green Star Award. To vote click here. In order to meet the obligations of our MOU with BBMP we realized the need to raise enough money to meet the maintenance expenses of the lake and to fund infrastructural ideas that were not a part of BBMP's restoration plan. 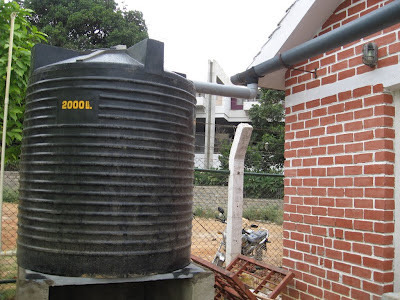 Apart from donations from individual well-wishers, we looked at unconventional methods too. Our participation in Mahindra Spark the Rise was one such effort and we were delighted to receive a grant from Mahindra to meet some of our infrastructure expenditure. 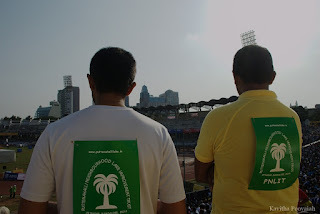 We raised some money by registering as an NGO for the TCS Bangalore 10K run. PNLIT now has a shop on eBay charity where miscellaneous products are put on sale and donations can be made. Donations to PNLIT are exempt u/s 80G of the Income Tax Act. We spend judiciously and make your rupee go a long way! We started new citizen-participation initiatives: Weekend Volunteers, Senior Citizen Volunteers, Community Gardening, Composting. We now grow vegetables at the lake and have planted lots of fruit trees, which we hope will help in making the lake self-sustaining in future. Our PNLIT Shutterbugs and Birdwatchers have diligently documented the bird visits to Puttenahalli Lake. More than 50 species of birds have been positively identified with photo captures! Partnering with Enzen, our trial on the treatment of polluted water with Nano-Nutrient Solution (NNS) was very successful. Though not used in our lake, this gives a possible solution to clear up pollutants in other lakes and bring them back to life. A few corporates have started associating with PNLIT by sending their volunteers to assist, as a part of their CSR. 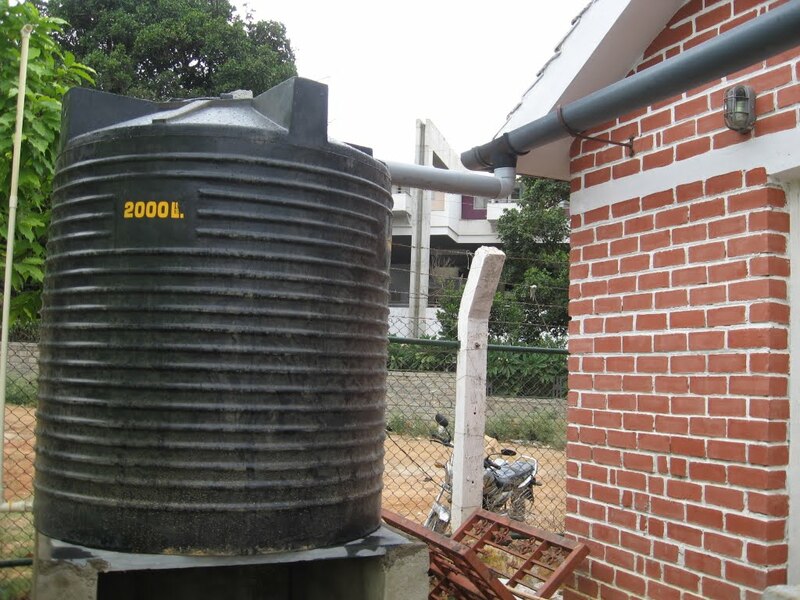 Another eco-initiative, Rain Water Harvesting is now operational at Puttenahalli Lake. We are harvesting the roof areas and diverting the water to storage tanks and ground-water recharge. We hope that apart from meeting some of the water needs of the lake, this will serve as a live model to educate visitors at the lake. Our other educational initiatives include Nature Walks and Bird Watching for adults and children, Birthday tours, Nature-related workshops, Environmental Sensitivity Sessions in schools. For our fitness enthusiasts who visit the lake for walks and jogs, we are happy that the lake area now has exercise bars – horizontal bars and parallel bars. This will eliminate your need to hold on to walls and trees to do your stretches! The year was not without its challenges. There have been issues that we've had to resolve, handle and sometimes endure at different points in time, including breaching of the fencing, damaging and jumping of the inner grill, damaging of the walkway, bike riding, late-night drinking, breaking of trees and saplings, writing on benches, fires, poaching birds and eggs, garbage dumping, inflow of grey/sewage water, labour issues. The relocation of the hutment inhabitants on the encroached area near L&T South City is one issue that is still to be resolved by the BBMP. One important activity that we were looking to complete before the monsoon this year was the diversion of rain water from Millennium Avenue (that is presently flowing the other way) into the lake and setting up a watering pipeline around the periphery. Unfortunately, we have not been able to receive the funding (approx Rs 15lakhs) for this. Diversion of rain water would help in significantly increasing the water level of the lake. LAKE=LIFE. Looking forward to your support and participation in our journey with Puttenahalli Lake. 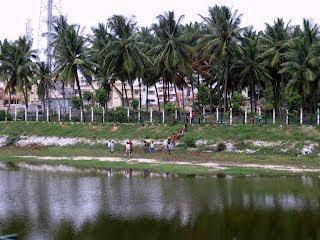 Many of you might have seen a group of about 20 youth working at our Puttenahalli Lake. They are from HSBC and today was the second time that they came to help clean up the lake bed. They are going to be helping for some more time, on Saturday mornings. Currently they are helping us pull out the weeds from the dry lake bed, and in the process deepening that much of the lake for water storage. You will also notice that the weeds on the island are being cleared. The intention is to allow the trees that are useful for the birds to perch and nest, grow without the hindrance of the other fast growing weeds and plants. We had sourced a variety of trees for the island including Arjuna Termanalia, Kadamba, Banni, Jamun and Cannon Ball, most of which are doing well. If anyone comes across saplings of Kaadu Maavu (Mango - forest variety & not hybrid) and Gooseberry (both the varieties), please procure them for the lake. Pictures of the HSBC volunteers and our gardeners at work here. 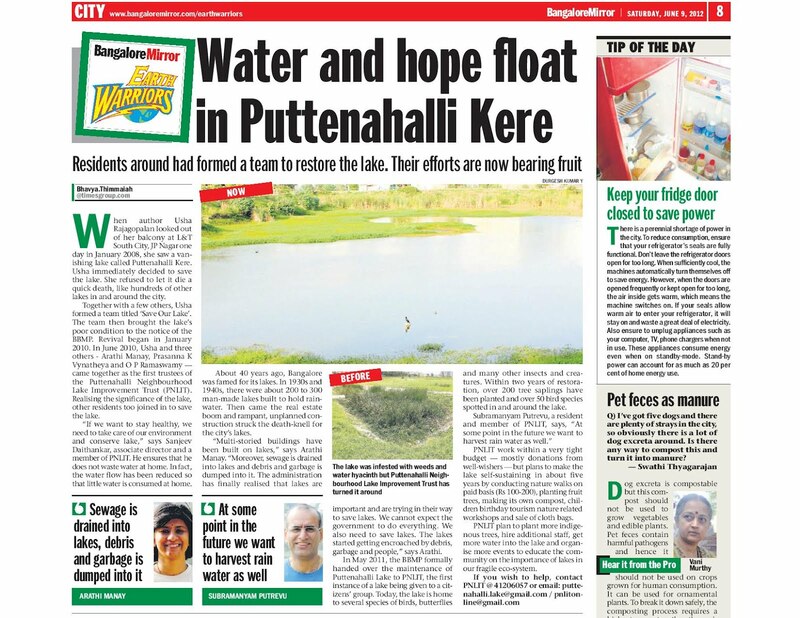 Read the article in Bangalore Mirror online here. Yesterday, 16 volunteers from HSBC spent the whole morning, from about 7 a.m. to noon, at the the lake. They helped in deweeeding some of the lake bed and lifting the weed litter out of the lake. These and more volunteers from HSBC will be helping out on all Saturdays through June. Mr. H.S. Balram of Radio Indigo 91.9 FM (Bangalore) spoke to PNLIT on the Puttenahalli Lake restoration and nurturing experience in an hour long programme called Namma Bengaluru This Week. Please tune in tomorrow, Sunday 3rd June, to Radio Indigo at 9 a.m. to hear Arathi and Usha in conversation with Mr. Balram.